As if the sudden appearance of Christmas hasn’t made you realise how quickly time is passing, the fact that School Of Rock – The Musical is turning two next week will make you wonder just where the time goes! Since opening in 2016 at the Gillian Lynne Theatre, dozens of talented children have picked up their instruments and put the grown-ups to shame. And leading the kids in musical glory is Craig Gallivan, who plays the iconic Dewey Finn. We spoke to Craig to get the lowdown on working with such talented kids, what it’s like stepping into Jack Black’s shoes, and how he got started in the biz. School Of Rock is turning 2! Why do audiences keep coming back for more? There’s something for all the family. We get such youngsters in. I sometimes look up into the audience and can’t believe how young some of them are. But still, their eyes just light up. And then they’ll have their grandmother or grandfather sitting next to them so you know there really is something for everybody – it’s a perfect vibe. It’s fun, there are lots of laughs… it’s a full-on rock show! As well as being a full-on rock show, it’s a celebration of the power of music – what did its story mean to you the first time you saw it? Seeing the show the first time, I had a bit of trepidation because I loved the film so much. But it just took the film on and grew it to be even greater than the movie I think. I mean to see the kids – some of them as young as 9 – on that stage holding instruments that are as big as them, playing them with such skill and passion, it’s mind-blowing. The story is that the power of music helps these kids grow and find themselves, but I get to see that with the young actors I work with. They join the cast and start rehearsals feeling timid, afraid to put a foot wrong, and a bit meek, but then within eight weeks, they just transform. It’s wonderful to watch on stage. As it is such an iconic film and Jack Black is such a big character, how did you approach the role? Well, Jack’s boots are impossible to fill. So I quickly ruled out trying to match him. I wanted to put my own stamp on it. People have a certain expectation when they come into the theatre, so you can’t completely reinvent who Dewey Finn is. But you also have to give a nod to Jack. So I tried to put my own stamp on it but gave a little sprinkling of what Jack Black did in the movie. And I think it’s working! As you’ve been both the alternate and full-time Dewey Finn, how different is it for you? When I was alternate, I did three shows a week. Doing the main Dewey is five. When I first got the gig I was sort of like, “oh, three shows a week, alright, it’s not what I want to get my teeth into, but fine!” but I was so grateful just to be doing three. It’s so killer. It’s the most energetic two and a half hours I’ve ever had to do. It’s just knee sliding and jumping off amps, and you don’t really leave the stage, so I very quickly realised that three is a good place to start! If I was dropped in to do five straight away, I probably would have died! I still wake up every day now limping out of bed. So it was a good journey starting as alternate. And I got to see a few other lads doing their thing and got some ideas from it. How have you found the atmosphere in the Gillian Lynne Theatre? It’s such a perfect theatre for the show. It used to be called the New London Theatre and the clue’s in the title – it’s not an oldy-worlde type space with a proscenium arch with Roman figurines coming out of it. It’s stark, but the front of the stage curves out into the audience. You’re right on top of them, and it just helps give it a really genuine concert feel. When I’m rocking out at the end with the kids, with sweat flying everywhere and the people in the front row getting soaked, it’s what you want. You want that visceral, live, rock concert feel, and the Gillian Lynne really lends itself to it. What’s it like having bandmates that are 10 instead of adult bandmates? It’s pretty breathtaking, to be honest. There are three teams of kids and every time you work with a kid you think, “wow, it just doesn’t get better than this!”. Every day before the show, there’s a warm-up for everybody, and once the stretching and the vocal warm-up are done, the rest of the cast disappear and just the main band stay on stage. So we have a little band session, just the five of us. Sometimes we play songs from the show, sometimes they’ll say “I’m learning this song by AC/DC, let’s play this,” and just watching them is unbelievable. It makes me wish I worked a little bit harder when I was 10! I sometimes struggle to keep up. It’s really humbling. It makes me, as a thirty-odd-year-old guy, want to go home and work a little bit harder to improve. I went on a bit of a strange journey. I’m from Swansea so as a Welshman, you start playing rugby when you’re six. My sister was the one doing ballet and drama. When I was 12, my sister’s singing teacher was taking a group of lads up to audition for Oliver at the London Palladium and they asked me to come along. I didn’t really want to sing and jump around on stage, I just wanted to play rugby. But they managed to convince me and dragged me along to London to audition for the Sam Mendes production of Oliver in the ‘90s. I ended up getting into the cast, moved to London and was in the cast for three or four months. That opened my eyes. That was the turning point. It made me realise that people get paid to do it! So I went home, took up drama as a hobby and did everything I could, and it just went from there. What tips would you give anyone who hopes to follow in your footsteps? If I go back to when I was 12 or 13, I did everything I could to practice in front of the audience, so I was in a youth theatre, I was getting singing tuition, I would enter random singing competitions in the local pub. You have to love it though because if you don’t, you won’t put the time in. If you do love it, just do as much as you can as often as you can, and slowly but surely, it starts to trickle in and you start to get better. Do you have a favourite moment from doing the show? Every single night, there’s the moment where the stage revolves and it’s the Battle Of The Bands, which the whole show is gearing up towards. We’re all set up and dressed in cool costumes, and we play this song that the audience has been waiting for – and it’s just electric. That’s a moment that makes my hair stand on end every night. In terms of a random one-off moment, we did a show a few months back, and the young lad playing Zack has this quiet moment where he teaches Dewey the song he’s written. But this is in the classroom, no one else is speaking, it’s just a really quiet guitar, and Zack sings it to Dewey. And right in the middle of it, he just tipped his head back and let out this absolutely massive sneeze. Like a huge sneeze – the floor vibrated. All the other cast had to put their heads down because they were laughing. And it just shows you how cool these kids are, because he just wiped his wet nose, said “ooh, excuse me,” and carried on where he left off. We were all in stitches and so were the audience. Little moments like that are crazy. It breaks the ice for a split second and makes everyone remember they’re watching a live show! I do like Stick It To The Man where Dewey teaches the kids to be rebellious and in touch with their angry side because up until that point, they’ve been a bit butter-wouldn’t-melt! They come from this posh school, and all of a sudden they get their teeth into some venomous rock. But really, it has to be Teacher’s Pet during the Battles Of The Bands, when the stage revolves and you can feel the energy in the room. If anybody’s yet to see School Of Rock, why should they go? You should go because you’ll see some of the best musicianship from the youngest musicians out there. You can come at any age and you’ll walk out with a smile on your face. 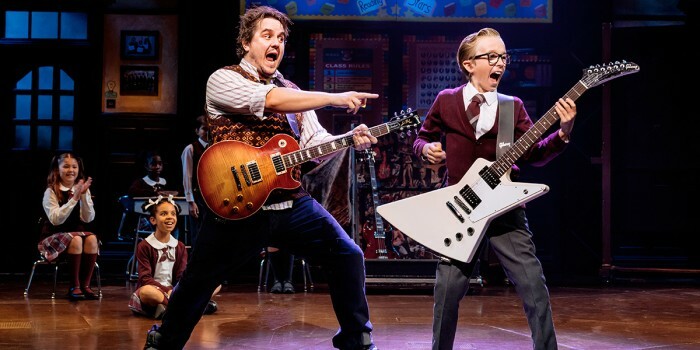 If Craig’s words have inspired you to help your kid get into theatre, School Of Rock is holding open auditions for kids to join the band next week! To find out more, click here. 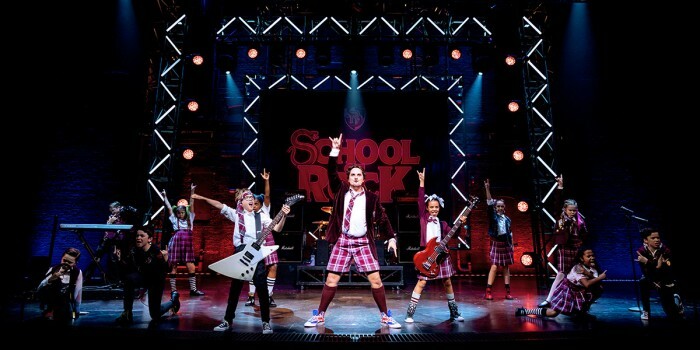 Book School Of Rock tickets!